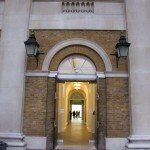 The Saatchi Gallery has occupied its current site at the Duke of York’s Headquarters in Chelsea since 2008. The Gallery has four floors of vast, high-ceilinged rooms, which host exhibitions of contemporary art – principally by unknown young artists, or international artists whose work is not widely known in the UK. By way of example, the major current exhibitions consist of a showcase of new art by 24 German artists (Gesamtkunstwerk: New Art from Germany, until 15 April) and a collection of photographs celebrating the 50th anniversary of The Sunday Times Magazine (closes today). Whether or not contemporary art is to your taste is entirely subjective. Personally, I found some works fascinating and others perplexing. Nonetheless, we happily spent an hour or two pondering the exhibits and taking in the impressive building. One of the refreshing aspects of the Gallery is its lack of ropes and cordons, allowing you to get up close to the art. I imagine that this could also be a major downside if you have small, curious children (reins advisable). As it is, my son is not at the walking stage yet and seemed to love staring at the sculptures made from discarded everyday items and the large, vibrant canvases in the New German Art exhibition. Somewhat less helpful for the layperson is the exhibition guide (£1) which, although necessary as there’s little information about the works in the rooms themselves, contains such insights as “there’s an explosive sense of future-retro abstract centripetal release”, a concept that’s a little difficult to get your head around when you are routinely obliged to get up at 5.30am. 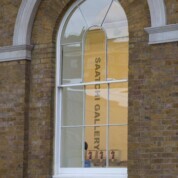 Parents will find the Saatchi Gallery’s cool, modern ambience a welcome contrast to the usual baby-focused days out. Despite that, the Gallery is all geared up for visitors with babies, and older children will enjoy exploring and talking about the innovative contemporary art. Note that the Gallery politely asks parents to ensure that children do not touch the exhibits, which are displayed without barriers. 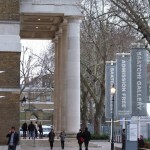 Admission to exhibitions at the Saatchi Gallery is free. Daily, 10am to 6pm, last entry 5.30pm. The Gallery has baby changing facilities and is fully accessible to pushchairs. There is a large square at the front of the Gallery – perfect for picnics or for children to run about and let off some steam. 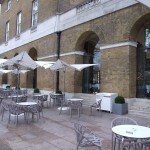 The Saatchi Gallery’s café, the Gallery Mess Restaurant, Bar and Café, is open Monday to Saturday from 10am to 11.30pm, Sunday 10am to 7pm. If its relatively smart/formal atmosphere puts you off, there is a Patisserie Valerie just outside the Saatchi Gallery’s main gate and plenty of alternative cafés in the immediate vicinity and along the King’s Road. Address: Duke of York’s HQ, King’s Road, London, SW3 4RY. By train: The nearest tube station is Sloane Square (District and Circle lines). The nearest national rail station is Victoria (10-12 minutes’ walk). By Bus: 11, 19, 22, 49, 211, 319 (King’s Road), 11, 137, 211 (Lower Sloane Street).